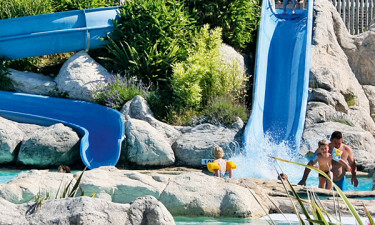 Les Alicourts Resort is a step above the average holiday camping site. This five-star resort boasts a picturesque setting and a beautiful natural environment, along with a great range of leisure and entertainment activities and some truly unique accommodation options. Book your stay at Les Alicourts Resort with Lux-Camp and enjoy an exclusive luxury camping experience. At this luxury campsite, you will have nearly 500 pitches to choose from. Traditional accommodation options include mobile home units. Why choose Les Alicourts for your next holiday? 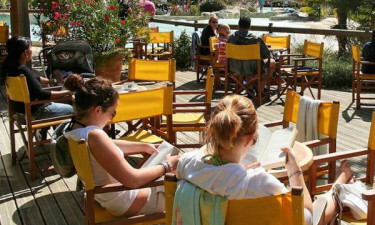 Below you will be able to read more about the reasons why you should choose to go on holiday to Les Alicourts. Les Alicourts Resort sports facilities will keep guests of all ages entertained. Highlights include a skate park, football pitches, tennis courts, mini-golf, a go-karting track, and a 9-hole golf course. The resort has its own water park featuring 4 pools and a lake that attracts swimmers, sunbathers, and wakeboarders. 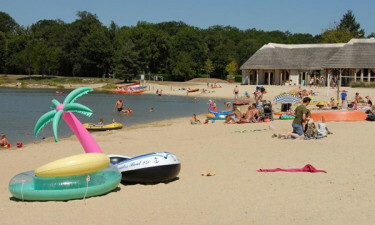 The lake has its own beach and is the perfect spot for a family picnic. Canoeing, boating, and fishing are also available. Daytime kids' activities are arranged by age group and include cooking lessons, treasure hunts, and art sessions. During the evening, guests can visit the mini disco or enjoy a movie screening. A library and a computer room complete the range of amenities available at Les Alicourts Resort. Nothing says camping luxury like dedicated spa and wellness facilities. Les Alicourts Resort offers a tempting range of treatments, including hydromassage, Finnish sauna, Jacuzzi baths, and a Turkish hammam. The spa treatment menu includes a variety of packages for couples and individuals, such as shiatsu, body wraps, aromatherapy, and beauty treatments. Guests can end their spa session at a Japanese-style tea room or enjoy a healthy dinner at the spa's garden. Please note: the pool area, the restaurant and the bar is open from the 5th of May to the 2nd of September. Les Alicourts has three on-site catering venues, offering a choice of indoor and outdoor settings and a variety of menu options, including a selection of French and international dishes cooked to order. There is an extensive take-away menu that includes a salad bar, pizzas, and snacks. Les Alicourts supermarket carries a varied selection of high-quality foodstuffs, personal care items, and baked goods. Other on-site shops sell gifts, souvenirs, clothing, and newspapers.